DigitalOcean provides scalable virtual private servers (called droplets), provisioned with SSD storage, in multiple locations, and provides DNS hosting. 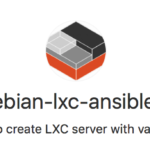 The LXC or Linux Containers may be defined as a way to isolate the tree process, the full user system, and the network configuration in a separate disk space (filesystem) into the same host thanks to the Linux kenel function to provide separate namespaces and control groups (cgroups) to access resources. In the container operating environment the system is showed as a complete installation of a linux distribution with its root user, system users, and normal users; its processes, crontab and services, its own installed software, its IP address and network configuration. 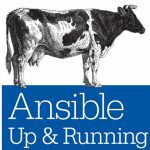 Perhaps, for these reasons it has been misunderstood many times as a guest system running into a virtualized environment, but it is not. The droplet (host) is a virtualized environment (KVM based) which only runs one kernel that manages all the processes, memory, network, blocks, etc. For this reason it is possible to create containers in it, because containers are only isolation. Moreover, droplets also come with just one public IP address, because of this a basic virtual network configuration is requried to access from outside to a service listen at the virtual IP of a container. How To Install and Use Docker: Getting Started, as docker is an application (daemon) level container. and then mount it with the command mount /sys/fs/cgroup. It is important full understanding of the network where the containers system will be connected, because you will need to forward ports and masquerade IPs and if you implement a full firewall configuration you will deal with inter-container communication rules. It is possible to create the container with any name -n: for this document firstc is the name. Also the template -t for this document is debian but you also have available fedora ubuntu-cloud and archlinux templates with default lxc installation. For the first container you will need to wait because all packages are being downloaded. From there on all packages will be copied from the local disk. and also install and configure what you wish into the container as any recent installed system, because the container may access Internet by masquerade with the droplet IP. line. This is equivalent to a static address configuration. A static IP address assigned by the DHCP matching the MAC address of the container. 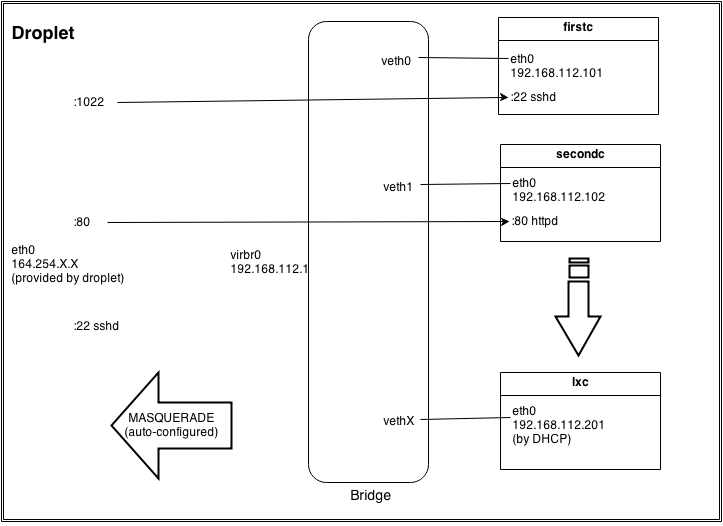 Virsh provides a basic dhcpd through dnsmasq. but if you are running containers they will lost their network and will be required to be restarted. in this case it is required to move the standard sshd port because the droplet has its sshd on 22 by default. In this case if no other container or doplet has a webserver, you may use the standard httpd port. Containers are fun and are supported by the droplets, so play with them.